JPS provides dredging solutions to clients throughout the South Eastern United States. Our team of certified technicians provides expertise in planning, equipment performance, and dredging support to ensure optimal productivity and a safe operating environment. 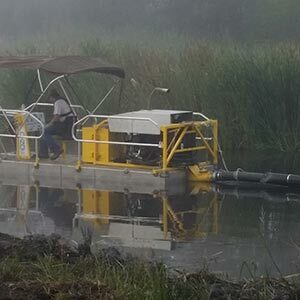 JPS dredges use a trolley system to systematically pump the lagoon to optimize efficiency and precision of sludge removal. Combined with the versatility, portability and performance capabilities of JPS’s dredging equipment and 24-hour emergency onsite service, JPS is ready and able to provide custom design solutions to suit any dredging project. © 2018 JPS Industries - All Rights Reserved.